A howitzer /ˈhaʊ.ɪtsər/ is a type of artillery piece characterized by a relatively short barrel and the use of comparatively small propellant charges to propel projectiles over relatively high trajectories, with a steep angle of descent. In the taxonomies of artillery pieces used by European (and European-style) armies in the 17th to 20th centuries, the howitzer stood between the “gun” (characterized by a longer barrel, larger propelling charges, smaller shells, higher velocities, and flatter trajectories) and the “mortar” (which was meant to fire at even higher angles of ascent and descent). Howitzers, like other artillery equipment, are usually organized in groups called batteries. The English word “howitzer” comes from the Czech word “houfnice“, from houf, “crowd”, and houf is in turn a borrowing from the Middle High German word Hūfe or Houfe (modern German Haufen), meaning “heap”. Haufen, sometimes in the compound Gewalthaufen, also designated a pike square formation in German. In the Hussite Wars of the 1420s and 1430s, the Czechs used short barreled “houfnice” cannons to fire at short distances into crowds of infantry, or into charging heavy cavalry, to make horses shy away. The word was rendered into German as aufeniz in the earliest attested use in a document dating from 1440; later German renderings include haussnitz and, eventually haubitze, from which derive the Scandinavian haubits, Croatian, Polish and Serbian haubica, Finnish haupitsi, Russian and Bulgarian gaubitsa (гаубица), Italian obice, Spanish obús, Portuguese obus, French obusier and the Dutch word houwitser, which led to the English word howitzer. Since the First World War, the word “howitzer” has been increasingly used to describe artillery pieces that, strictly speaking, belong to the category of gun-howitzers – relatively long barrels and high muzzle velocities combined with multiple propelling charges and high maximum elevations. This is particularly true in the armed forces of the United States, where gun-howitzers have been officially described as “howitzers” for more than sixty years. Because of this practice, the word “howitzer” is used in some armies as a generic term for any kind of artillery piece that is designed to attack targets using indirect fire. Thus, artillery pieces that bear little resemblance to howitzers of earlier eras are now described as howitzers, although the British call them guns. 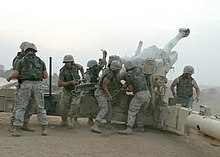 Most other armies in the world reserve the word “howitzer” for guns with barrel lengths 15 to 25 times their caliber, with longer-barreled guns being termed “cannons“. The British had a further method of nomenclature. In the 18th century, they adopted projectile weight for guns replacing an older naming system (such as culverin, saker, etc.) that had developed in the late 15th century. Mortars had been categorized by calibre in inches in the 17th century and this was inherited by howitzers. Current U.S. military doctrine defines howitzers as any cannon artillery capable of high-angle (45° to 90° elevation) and low-angle (45° to 0° elevation) fire; guns are defined as being only capable of low-angle fire, and mortars only capable of high-angle fire. The modern howitzers were invented in Sweden towards the end of the 17th century. These were characterized by a shorter trail than other field guns, meaning less stability when firing, which reduced the amount of powder that could be used; armies using these had to rely on a greater elevation angle to achieve a given range, which gave a steeper angle of descent. Originally intended for use in siege warfare, they were particularly useful for delivering cast-iron shells filled with gunpowder or incendiary materials into the interior of fortifications. In contrast to contemporary mortars, which were fired at a fixed angle and were entirely dependent on adjustments to the size of propellant charges to vary range, howitzers could be fired at a wide variety of angles. Thus, while howitzer gunnery was more complicated than the technique of employing mortars, the howitzer was an inherently more flexible weapon that could fire its projectiles along a wide variety of trajectories. In the middle of the 18th century, a number of European armies began to introduce howitzers that were mobile enough to accompany armies in the field. Though usually fired at the relatively high angles of fire used by contemporary siege howitzers, these field howitzers were rarely defined by this capability. Rather, as the field guns of the day were usually restricted to inert projectiles (which relied entirely on momentum for their destructive effects), the field howitzers of the 18th century were chiefly valued for their ability to fire explosive shells. Many, for the sake of simplicity and rapidity of fire, dispensed with adjustable propellant charges. The Abus gun was an early form of howitzer in the Ottoman Empire. In 1758 the Russian Empire introduced a specific type of howitzer (or rather gun-howitzer), with a conical chamber, called a licorne, which remained in service for the next 100 years. 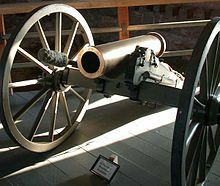 In the mid-19th century, some armies attempted to simplify their artillery parks by introducing smoothbore artillery pieces that were designed to fire both explosive projectiles and cannonballs, thereby replacing both field howitzers and field guns. 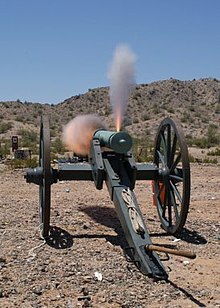 The most famous of these “gun-howitzers” was the Napoleon 12-pounder, a weapon of French design that saw extensive service in the American Civil War. 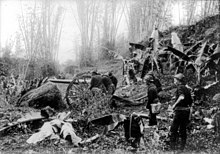 The longest-serving artillery piece of the 19th century was the mountain howitzer, which saw service from the war with Mexico to the Spanish–American War. In 1859, the armies of Europe (including those that had recently adopted gun-howitzers) began to rearm field batteries with rifled field guns. These new field pieces used cylindrical projectiles that, while smaller in caliber than the spherical shells of smoothbore field howitzers, could carry a comparable charge of gunpowder. Moreover, their greater range let them create many of the same effects (such as firing over low walls) that previously required the sharply curved trajectories of smoothbore field howitzers. Because of this, military authorities saw no point in obtaining rifled field howitzers to replace their smoothbore counterparts but, instead, used rifled field guns to replace both guns and howitzers. In siege warfare, the introduction of rifling had the opposite effect. In the 1860s, artillery officers discovered that rifled siege howitzers (substantially larger than field howitzers) were a more efficient means of destroying walls (particularly walls protected by certain kinds of intervening obstacles) than smoothbore siege guns or siege mortars. Thus, at the same time armies were taking howitzers of one sort out of their field batteries, they were introducing howitzers of another sort into their siege trains and fortresses. The lightest of these weapons (later known as “light siege howitzers”) had calibers around 150 mm and fired shells that weighed between 40 and 50 kilograms. The heaviest (later called “medium siege howitzers”) had calibers between 200 mm and 220 mm and fired shells that weighed about 100 kilograms (220 pounds). In the Russo-Turkish War of 1877–1878, the inability of rifled field guns to inflict significant damage on field fortifications led to a revival of interest in field howitzers. By the 1890s, a number of European armies fielded either light (105 mm to 127 mm) or heavy (149 mm to 155 mm) field howitzers and a few, such as that of Germany, fielded both. During the 1880s, a third type of siege howitzer was added to inventories of a number of European armies. With calibers that ranged between 240 mm and 270 mm and shells that weighed more than 150 kilos, these soon came to be known as “heavy siege howitzers”. A good example of a weapon of this class is provided by the 9.45-inch (240 mm) weapon that the British Army purchased from the Skoda works in 1899. Intended for use against the fortifications of Pretoria, which fell before the howitzer could be used, and subsequently deployed to China for use against the fortifications of Peking, which also fell without a siege, the 9.45-inch (240 mm) howitzer was never fired in anger. 38 cm siege howitzer, Austria Hungary 1916, in the Heeresgeschichtliches Museum, Vienna. In the early 20th century, the introduction of howitzers that were significantly larger than the heavy siege howitzers of the day made necessary the creation of a fourth category, that of “super-heavy siege howitzers”. Weapons of this category include the famous Big Bertha of the German Army and the 15-inch (381 mm) howitzer of the British Royal Marine Artillery. These large howitzers were transported mechanically rather than by teams of horses. They were transported as several loads and had to be assembled at their firing position. These field howitzers introduced at the end of the 19th century could fire shells with high trajectories giving a steep angle of descent and, as a result, could strike targets that were protected by intervening obstacles. They could also fire shells that were about twice as large as shells fired by guns of the same size. Thus, while a 75 mm field gun that weighed one ton or so was limited to shells that weighed less than 8 kilograms, a 105 mm howitzer of the same weight could fire 15 kilogram shells. This is a matter of fundamental mechanics affecting the stability and hence the weight of the carriage. However, howitzers had a shorter maximum range than the equivalent gun. As heavy field howitzers and light siege howitzers of the late 19th and early 20th centuries used ammunition of the same size and types, there was a marked tendency for the two types to merge. At first, this was largely a matter of the same basic weapon being employed on two different mountings. Later, as on-carriage recoil-absorbing systems eliminated many of the advantages that siege platforms had enjoyed over field carriages, the same combination of barrel assembly, recoil mechanism and carriage was used in both roles. Guns – higher velocity and longer range, single charge propellant, maximum elevation generally less than 35 degrees. Howitzers – lower velocity and shorter range, multi-charge propellant, maximum elevation typically more than 45 degrees. The onset of trench warfare after the first few months of the First World War greatly increased the demand for howitzers that gave a steep angle of descent, which were better suited than guns to the task of striking targets in a vertical plane (such as trenches), with large amounts of explosive and considerably less barrel wear. The German army was well equipped with howitzers, having far more at the beginning of the war than France. Many howitzers introduced in the course of World War I had longer barrels than pre-war howitzers. The standard German light field howitzer at the start of the war (the 10.5 cm leichte Feldhaubitze 98/09) had a barrel that was 16 calibers long, but the light field howitzer adopted by the German Army in 1916 (105 mm leichte Feldhaubitze 16, see on the left) had a barrel that was 22 calibers long. At the same time, new models of field gun introduced during that conflict, such as the 77 mm field gun adopted by the German Army in 1916 (7,7 cm Feldkanone 16) were often provided with carriages that allowed firing at comparatively high angles, and adjustable propellant cartridges. In other words, there was a marked tendency for howitzers to become more “gun-like”, while guns were taking on some of the attributes of howitzers. In the years after World War I, the tendency of guns and howitzers to acquire each other’s characteristics led to the renaissance of the concept of the gun-howitzer. This was a product of technical advances such as the French invention of autofrettage just before World War I, which led to stronger and lighter barrels, the use of cut-off gear to control recoil length depending on firing elevation angle, and the invention of muzzle brakes to reduce recoil forces. Like the gun-howitzers of the 19th century, those of the 20th century replaced both guns and howitzers. Thus, the 25-pounder “gun-howitzer” of the British Army replaced both the 18-pounder field gun and the 4.5-inch howitzer. While this had the effect of simplifying such things as organization, training and the supply of ammunition, it created considerable confusion in the realm of nomenclature. In the US Army, however, the preferred term was “howitzer”. Thus, as gun-howitzers replaced both guns and howitzers, words such as “obusier” (French) and “Haubitze” (German), which had originally been used to designate weapons with relatively short barrels, were applied to weapons with much longer barrels. During World War II, the military doctrine of Soviet deep battle called for extensive use of heavy artillery to hold the formal line of front. Soviet doctrine was remarkably different from the German doctrine of Blitzkrieg, and called for a far more extensive use of artillery. As a result, howitzers saw most of the action on the Eastern front, and most of the best howitzers of the WWII period were Soviet-made, as other allies mostly relied on different types of assault for the battle. Most of the howitzers produced by the USSR at the time were not self-propelled, as the country did not have resources to spare for the construction of the engines for the self-propelled variants. Notable examples of Soviet howitzers include the M-10, M-30 and D-1. As Soviet howitzers were deployed a lot more than comparable Allied or Axis guns, they often had worse “paper characteristics”[clarification needed] that were deliberately sacrificed to improve operational performance and the usability of the artillery pieces by the deployed troops. Since World War II, most of the artillery pieces adopted by armies for attacking targets on land have combined the traditional characteristics of guns and howitzers—high muzzle velocity, long barrels, long range, multiple charges and maximum elevation angles greater than 45 degrees. 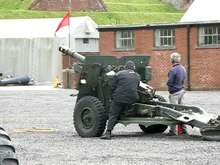 The term “gun-howitzer” is sometimes used for these (e.g., in Russia); many nations use “howitzer”, while the UK (and most members of The Commonwealth of Nations) calls them “guns”, for example Gun, 105 mm, Field, L118. A self-propelled howitzer is mounted on a tracked or wheeled motor vehicle. In many cases, it is protected by some sort of armor so that it superficially resembles a tank. This armor is designed primarily to protect the crew from shrapnel and small arms fire, not anti-armor weapons. A pack howitzer is a relatively light howitzer that is designed to be easily broken down into several pieces, each of which is small enough to be carried by mule or pack-horse. A mountain howitzer is a relatively light howitzer designed for use in mountainous terrain. Most, but not all, mountain howitzers are also pack howitzers. A is a howitzer that is designed to be fired from a mounting on a fixed platform of some sort. A field howitzer is a howitzer that is mobile enough to accompany a field army on campaign. It is, invariably, provided with a wheeled carriage of some sort. ^ The Concise Oxford English Dictionary, 4th edition reprinted, 1956: “Howitzer’. ^ Paul, Hermann. 1960. Deutsches Wörterbuch. “Haubitze”. ^ German Medieval Armies 1300–1500. 1985-11-28. p. 16. ISBN 9780850456141. ^ “houfnice” in Václav Machek, Etymologický slovník jazyka českého, second edition, Academia, 1968. ^ Stephen Turnbull: The Hussite Wars, 1419–36 . p. 37. ^ (Retd. ), Col Y. Udaya Chandar (2017-04-24). The Modern Weaponry of the World’s Armed Forces. Notion Press. ISBN 9781946983794. ^ “William Johnson, “The Sultan’s Big Guns.” Dragoman, vol.1, no.2″. Archived from the original on July 10, 2007. Retrieved 2017-04-05. ^ Konstam, Angus (1996). Russian Army of the Seven Years War (2). Men-at-Arms. Londyn: Osprey Publishing. p. 41. ISBN 978-1-85532-587-6. ^ Gudmundsson, Bruce I. (1993). On Artillery. Greenwood Publishing Group. ISBN 978-0-275-94047-8.